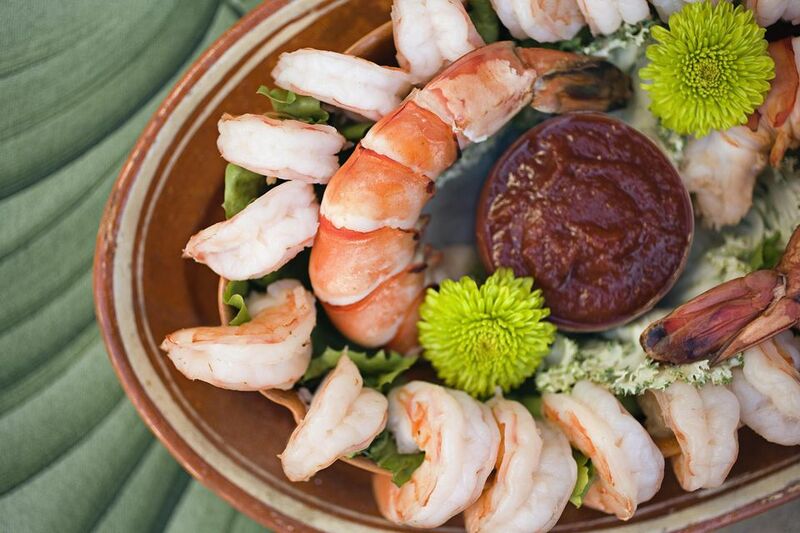 There's just nothing like spicy and homemade cocktail sauce as a condiment for cold seafood, like shrimp or oysters. It's also delicious on things like crab cakes and fried calamari. It's simple to make at home, just hours before you serve it. Plus you can make it as hot as you want or slightly vary the flavor with a few changes in the recipe. Thoroughly stir together the ketchup, horseradish, Worcestershire sauce, hot sauce and lemon juice. Chill for at least an hour to let the flavors seep through the sauce. Serve cold. Cocktail sauce recipes vary only slightly from one to another. Some use half ketchup, half chili sauce, horseradish, lemon juice, Worcestershire sauce and Tabasco, or Louisiana hot sauce. Others substitute Sriracha sauce for the Tabasco. Still, others lose the ketchup all together and up the amount of chili sauce and follow the rest of the basic recipe. Change up your recipe depending on how much heat and spice you want. Shrimp cocktail, simple as it is, made a huge splash around the mid-20th century and was de rigueur as an appetizer at fine restaurants where you went to celebrate anniversaries and birthdays and dropped a bundle for the experience. But this sophisticated classic has gone the way of so many midcentury icons, like fedoras and Frank Sinatra. It's very hard to find at most restaurants but sometimes still shows up on the menu at steakhouses. If you crave some of this midcentury magic, you just about have to make it at home. Cook about 30 large shrimp in the shell in a large pot with a lemon cut in half. Cook about 3 minutes, until the shrimp are cooked through. When you can handle the shrimp, move them to a large bowl filled with cold water. Peel and devein them and keep them in the fridge until you are ready to serve them. If you are serving shrimp cocktail as part of a buffet, place the shrimp in a large glass bowl, with sliced lemons as a garnish, just before everyone arrives, with the cocktail sauce on the side. If you are serving them as a sit-down dinner appetizer, serve the assembled cocktail in stemmed bowls. And don't forget to accompany it with a dry martini, Manhattan or old-fashioned. And turn up the volume on that Sinatra.